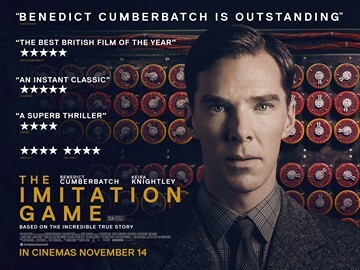 The tagline on the first teaser poster accurately summarized its plot succinctly: “The true enigma was the man who cracked the code.” His name was Alan Turing (Benedict Cumberbatch) and from the beginning, he was “different.” He became a brilliant logician, mathematician, cryptanalyst, and a father of the modern computer. And, during World War II, when Britain needed a genius to challenge and command a team to crack Nazi Germany’s Enigma Code, Turing became that man. This is his story and it’s a true historical thriller. In Turing’s group are five men and one woman. Joan Clarke (Kiera Knightley) will be Turning’s fiancé, lifelong friend, someone he loved to talk to, and one of the few he ever considered his equal. The movie largely focuses on Turing’s wartime feats, but in telling that story, it toggles effortlessly and often back to his days at Sherborne School in the 1920’s – and forward to the early 1950’s when his life became a testimony to the power of ignorance. Cumberbatch brings this flawed genius to life in ways that are haunted and hunting, triumphant and tragic. His is a performance built of tics and tears and tentative gestures – the chewed lip, the halting speech, the tilted head. He evokes humor from Turing’s ability to be oblivious to the obvious; he builds tension by his fierce protection of the important. And along the way, he and Knightley share moments that are so emotionally powerful because they are so humanly truthful; the man who broke the code will – several times during this film – break your heart. Turing’s story is essentially true, but the writer (Moore) and director (Tyldum) moved characters and events across space and time to create a fascinating, if slightly long, movie. This is entertainment, not a documentary; but Cumberbatch is fully in control and he’ll leave you enlightened – and angry. Turing’s “difference” shortened World War II and saved thousands of British lives. And how did his country repay him for that “difference?” Ah, that’s the part that will make you mad.